Congratulations on the final day of the Autumn 2017 quarter! I would like to thank all of you for your hard work and dedication to our shared cause of preparing the next generation of nurse leaders, conducting innovative research and making an impact in communities in Seattle and throughout the world. Integrated goals across the academic spectrum will help us realize this vision. I am pleased to announce that we made wonderful progress this quarter. Below are some of our major accomplishments. Last year, we developed a five-year operational road map and prepared a report to the UW Provost defining the school’s goals over the next three years. Faculty workload: In response to a request by the Provost last year, we began thinking proactively about faculty salary equity, compression and inversion. The faculty council, department chairs and leadership team, under the guidance of Pam Mitchell and Jen Thompson, responded to this request by building on our ongoing work on our strategic academic business plan, strategic enrollment management plan and our five-year roadmap that incorporates salary issues. As a result, the Shared Leadership Council led Faculty Council began analyzing the faculty mix and workload. This quarter, we have held a series of school-wide sessions to discuss a revised faculty workload model in an effort to ensure a thoughtful and transparent process in which all faculty have input. Simulation Center: We opened our new Simulation Center this fall, providing students with 7,500 square feet of learning space, more than triple the size of the former lab. Students now learn on state-of-the-art equipment. A broader range of technology in one location provides a more enriching learning environment, allowing students to master skills they will need to become successful nurses and nurse leaders. Learn more. Strategic enrollment management plan (SEMP): The SEMP provides a holistic and formal process to evaluate nursing’s existing and new academic program offerings. The plan is led by Dr. Anne Hirsch, our new Associate Dean of Academic Affairs, in coordination with the five-year operational road map work. Student and Academic Services and faculty have partnered to pursue new DNP recruitment strategies, including early-admission to the DNP program that allows students to apply for the ABSN and DNP at the same time. Track-focused recruiting sessions worked to bolster enrollment in targeted degree programs. Online application: Our school launched an undergraduate online application system that allows students to apply fully online. This is not only a convenience for our prospective students, but also streamlines the admissions process for faculty and staff. Science is at the front and center of our institution and the foundation of everything we do. Our Office for Nursing Research (ONR) is an essential operational resource. Operational excellence: ONR developed new systems aimed at streamlining and modernizing many of its key services, including the Research and Intramural Funding Program, Modeling Parties, and Lab Space requests, which will launch in 2018. The office also provided targeted training sessions on applications for K-series awards, which are designed to promote the career development of specific groups of individuals based on their past training and career stage. These improvements will help the office provide targeted programming and services for researchers to encourage external funding growth. Research and Intramural Funding Program (RIFP): The RIFP provides seed funding to support innovative pilot studies, allowing faculty to apply for federal funding with important preliminary data in hand. Four RIFP grants were awarded in the Spring cycle, Drs. Eeeseung Byun, Monica Oxford, Cynthia Price and Anita Souza to conduct pilot research in the areas of healthy aging, mindfulness and sleep disturbance directly supporting the research pillars, symptom science, lifespan health and innovative interventions. Fall cycle awards are pending. Laboratory services and consultation: Our laboratory testing services and renowned research expertise are available to researchers within the UW system and throughout the United States. ONR secured four new projects, two with UW researchers and one each with researchers at Columbia University and Seattle Pacific University. ONR methodologists provided more than 320 hours of direct, one-on-one consultation time supporting approximately 50 UW School of Nursing faculty and staff. In 2018, ONR will add consultations in collaboration with the Center for Global Health Nursing. Fostering an open, inclusive, equitable and welcoming environment continues to be one of our school’s top priorities. The Office for Diversity, Equity and Inclusion, under the leadership of the new Associate Dean Dr. Butch de Castro, facilitates efforts by faculty, staff, and students to accomplish goals as described in the Diversity Strategic Plan. New student orientation: Diversity vignettes were used as a basis for discussion and understanding as part of new student orientation. This discussion allowed students (in facilitated small groups) to consider anonymous scenarios of real student experiences that a lack of consideration of differences in social contexts and social position intentionally or unintentionally that promote negative interpersonal exchanges or institutional climate. Student groups shared their interpretations of these scenarios and offered perspective about what actions could be taken in response. Faculty presentations and training: Presentations by Dr. Rebecca O’Connor (Department of Family & Child Nursing) on implicit bias and Dr. Wendy Barrington (Department of Psychosocial & Community Health) on inclusive teaching were included as part of new faculty/teaching assistant orientation. Attendees received principles, strategies and resources to help promote an inclusive learning environment for students. HEED award: Our school received the 2017 Health Professions Higher Education Excellence in Diversity (HEED) Award from INSIGHT Into Diversity magazine, the oldest and largest diversity-focused publication in higher education. The Health Professions HEED Award is a national honor recognizing U.S. medical, dental, pharmacy, osteopathic, nursing, veterinary and allied health schools that demonstrate an outstanding commitment to diversity and inclusion. Learn more about this award. Outreach and recruitment: We hosted the largest UW Nurse Camp, in which 30 high school students from backgrounds that are underrepresented in nursing or who are the first in their family to go to college experienced nursing school. We established a standing faculty recruitment team led by Dr. de Castro and faculty representatives from all departments to proactively identify highly qualified individuals who fit our needs, vision and priorities. We have begun exploring a new outreach and recruitment program, I’mNursePossible, which would build on UW Nurse Camp’s success and promote nursing as a college major and professional career to middle-school students. Watch Dr. de Castro’s I’mNursePossible pitch at Nursing Shark Tank. Curriculum re-envisioning: Re-envisioning of the BSN program includes ongoing efforts to work with the our Office of Diversity, Equity & Inclusion and one of our school’s Innovative Educators, Dr. Rebecca O’Connor, to guide curricular changes and develop training/resources reflective of social justice and social determinants of health. Re-visioning of the PhD program also will call on the Office of Diversity, Equity & Inclusion for consultation. The scope and perspective of nursing has become global. Our Center for Global Health Nursing is an important part of the network of UW academics working in global health research and training across disciplines and across borders to improve health and address questions of health disparities locally and worldwide. Global-to-Local Scholars Program: Dr. Sarah Gimbel, co-director of the Center for Global Health Nursing, was voted the winning presenter at Nursing Shark Tank and received $10,000 in funding for her project, Bringing Global Lessons Home: Gardens, Pathways and the Microbiome. This project inaugurates the Global to Local Scholars Program whereby nursing students will study health problems locally and abroad to identify translational solutions. For this first round, two nursing scholars will work with UW Homeless Initiative sites to identify challenges in the built environment of informal and small housing communities in Seattle. Subsequently their work will link to an existing Population Health Initiative project being carried out in the Peruvian Amazon by nursing and other UW faculty. Students will participate in a multidisciplinary initiative to assess the impact of improvements to the built environment of a floating community with no services or infrastructure, and identify best practices for application to the State of Washington’s homeless communities. Watch her presentation. Global Rural Health Fellowship: Applications opened for the center’s new 18-month fellowship for DNP graduates, in partnership with the School of Medicine’s Global Rural Health Fellowship program. Two DNP fellows will spend one year in working in Alaska with an additional six months in an international country setting (either Nepal, Peru, Kenya or Thailand). The fellows will work primarily in the rural Eastern Aleutian Islands, only accessible by seaplane and serving underserved populations in low-resourced settings. The first two fellowship recipients will be announced in December 2017. Learn more about the fellowship. Visiting scholar: Dong Pang, PhD, MN, arrived at UW in October from the Peking University School of Nursing in China through the center’s visiting scholar program. While at the UW, Dr. Pang hopes to learn more about intervention programs and experimental studies on cancer patients. She plans to use this knowledge, while at UW, to develop an intervention program on bowel symptom management of rectal cancer patients after sphincter preserving surgery. In addition, she hopes to complete a systematic review of symptom self-management for cancer patients. Dr. Pang’s faculty mentor is Dr. Margaret Heitkemper, Chair of the Department of Biobehavioral Nursing and Health Informatics. Dr. Pang will be at UW until September 2018. Much of the good we accomplish is made possible by private support: by people and organizations underwriting leading-edge research, funding scholarships for promising students, and supporting world-class faculty members. New leadership: Kevin Fralicks, an experienced fundraising executive with a background in university advancement and city government, was selected as the UW School of Nursing’s next Chief Advancement Officer. Fralicks joined our school from the University of North Texas College of Business, one of the largest business colleges in the country. He joined our school’s executive leadership team and oversees our school’s fundraising efforts and team. Final proceeds from Kathryn Barnard’s estate will be used to establish an endowment to support the operations of the Barnard Center for Infant Mental Health and Development. The Mary S. Tshudin Endowed Professorship, made possible by a gift from an anonymous donor, will enhance the recruitment and retention of high-quality nursing educators. An endowment from the former Hope Heart Institute, which closed earlier this year, will support cardiac prevention research and behavior-based prevention education. Student scholarships: This year, our school was able to provide more scholarship funding ($1.6 million) to students, reducing the overall amount of need to $9.6 million. This amount is down from $10.2 million in 2016. Centennial planning: In 2018, our school will celebrate 100 years of nursing education at UW. Planning for celebrations of this milestone are underway with the leadership of a Centennial Task Force. The Task Force is chaired by Advisory Board members and Alumnae Charyl Kay Sedlik and Sandy Dyer. Task Force members include Executive Associate Dean Dr. Pamela Mitchell; Theresa Urquhart, Advisory Board Member and alumna; Vivian Lee, alumna and Washington State Nurses Association Hall of Fame member; and Dr. Weichao Yewen, alumna and junior faculty member at UW Tacoma. A centennial theme will be woven into the school’s annual events starting in May. A Centennial Brunch is planned for Sept. 29, 2018. Engagement events: Attending an event is one of the best ways to understand what nurses do and (just as importantly) the impact that our school and alumni make every day. These events also serve as a way to build relationships with supporters and friends, as well as engage community and corporate partners. This quarter, our major events included the Grand Opening of the Simulation Center, Nursing Shark Tank, a reception in honor of the new Best Starts for Kids partnership with Public Health – Seattle & King County and the Elizabeth Sterling Soule Endowed Lecture featuring keynote speaker Dr. Bobbie Berkowitz, dean of the Columbia School of Nursing. Our administration teams are dedicated to leveraging resources across our school to support our school’s mission most effectively and efficiently. Continuing Nursing Education reaccreditation (CNE): CNE achieved reaccreditation with distinction through the American Nurses Credentialing Center, effective Sept. 25, 2017 to March 31, 2022. This allows CNE to continue to offer quality lifelong learning opportunities to not only those living and working in the Puget Sound Area, but also to expand the school’s impact regionally, nationally and even globally. 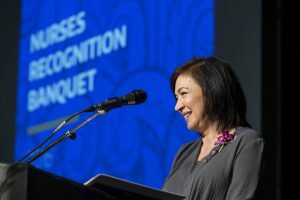 As an example of a quality learning opportunity, CNE was able to bring suicide prevention training to more than 2,600 nurses either via an online course or an in-person conference. Balanced FY18 school budget: Finance and Administration, working in concert with the school’s academic departments and business units, completed a balanced FY18 school budget. The budget allows the school to make progress on its education, research and service goals while taking into account additional expenses, such as the university’s new HR/Payroll system, Workday, and the state-mandated 2 percent faculty and staff merit raises without additional funding allocations. Enhanced online bios: Searching for faculty and staff bios on nursing.uw.edu is now easier as a result of several enhancements made by the Learning & Information Technologies and Marketing & Communication teams. Bios can now be accessed via last name initial and department or unit, in addition to keyword searches and filters, such as center affiliation and research areas. Bios also include a more complete list of research publications pulled from an automatic feed from PubMed, a database of scientific articles maintained by the U.S. National Library of Medicine at the National Institutes of Health. This gives users more direct access to the scholarly work being produced by our faculty. Faculty Clinical Passport tracking: The Clinical Passport tracking system has been expanded to include faculty, in addition to students. Clinical Passports ensure that faculty and staff meet our clinical partners’ compliance requirements for immunization history and other areas. The new tracking system streamlines the tracking and verification process, allowing faculty and students to participate in the clinical rotations and gain valuable hands-on healthcare experience. Dean’s Office Team: The Dean’s Office Team includes two temporary employees while we complete the hiring process to fill the positions permanently. Rebecca Kovar is my interim executive assistant. Please contact her regarding my calendar and related communications at rrkovar2@uw.edu or 206.221.2472. Lisa Williams is my interim administrative coordinator. Please contact her regarding requests related to the dean’s travel at lw20@uw.edu or 206.616.0889. Congratulations on a wonderfully productive quarter. Each of you make a unique and valuable contribution to help advance our institution and excel in all the crucial areas that impact the health and health care of populations here in our state, in the U.S. and globally. Have a safe and happy winter break and holiday season. I look forward to working with each of you in the New Year.